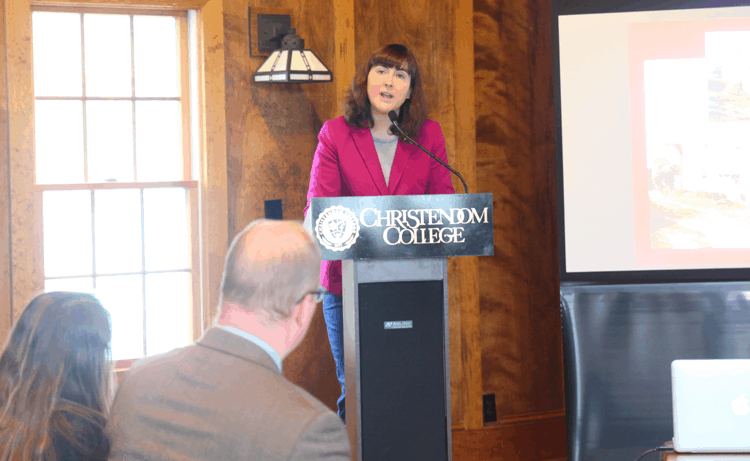 Christendom College welcomed Professor Bronwen McShea to campus to deliver a talk titled, “One World Was Not Enough for Her”: Cardinal Richelieu’s Heiress and Her Missionary Empire on Monday, April 15. Sponsored by the college’s history department, the talk transfixed students as they learned about Marie Madeleine de Vognerot du Pont de Courley, the niece of the famed Cardinal Richelieu, and her efforts to develop and expand the French church and its social, charitable, and cultural presence in remarkable ways in America, Africa, and Asia during the 17th century. McShea, the 2018-19 associate research scholar for Princeton’s James Madison Program, is currently finishing a book titled, Apostles of Empire: The Jesuits and New France. She paused from that work to visit with the faculty and students at Christendom to talk about Richelieu’s heiress, who later became known as Maria Madeleine d’Aiguillon, due to her status as Duchess of Aiguillon. McShea split her talk about into four parts, speaking first on the background of the Duchess. Later, she explained why she was writing a book about her, followed by a deeper overview of the Duchess’missionary empire. Finally, McShea gave her thoughts on the Duchess’ contributions to history. “d’Aiguillon’s story is significant, especially what it suggests about the contributions of laypersons, especially laywomen, in shaping the institutions of the Catholic Church in the early modern era,” said McShea.